Thomas Zahn of Cary used to fall asleep during his therapeutic riding lesson at Horse & Buddy, soothed by the movement of the horse. Not anymore. Now 15, riding is his sport, building his leg and core muscles as he deals with Down syndrome and autism. Sarah Kiegiel of Cary couldn’t sit up in a chair when she began riding at age 2, due to a stroke that followed brain tumor surgery. She cried with discomfort at her lessons, but two months into the program took her first steps. Now, at 14, she sits straight and smiling on horseback. For Kathleen Warren of Cary, 22, better balance and motor skills are just part of the reason to ride. Diagnosed with leukemia at age 2, radiation and chemo treatments led to brain damage and seizures. She can’t run or pedal a bike, but she can ride. These are just some of the inspiring stories of young people who continue getting back up on the horse — literally — at Horse & Buddy. 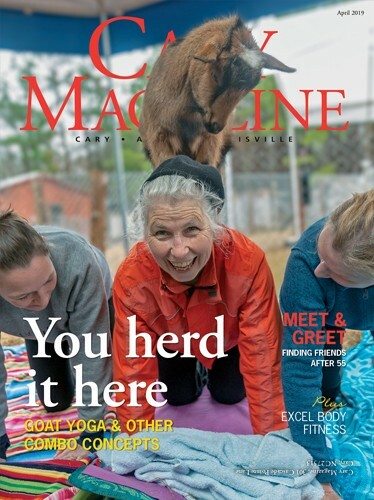 The first Cary Magazine Gives Back charity partner, Horse & Buddy serves 75 child and adult riders weekly whose life challenges include Down syndrome, cerebral palsy, multiple sclerosis and autism. “We provide therapeutic riding focused on teaching riding skills, recreational riding, and hippotherapy, which is done by a licensed therapist and uses the horse as a therapy tool,” said Executive Director Janet Haithcox. “One of the first things we see is improvement in core strength. We see children sit up for the first time, and we see a lot of improvement in balance and coordination. Self-esteem also increases as they are able to control a 1,000-pound horse. And those on the autism spectrum often bond quickly with animals and verbalize more while riding. “We have all seen the incredible benefit that the program brings to our riders,” Haithcox said. The success stories keep Haithcox and the Horse & Buddy team working to raise money and materials to improve the program. Funded mostly by individual donations of $100 or less, the nonprofit relies on annual events, like its Sequins & Spurs Gala, and community partners to maintain and grow. Horse & Buddy’s sensory trail, for example, was built by a Leadership Raleigh group. Eagle Scouts have worked the grounds, and the arena fan, sprinkler system and hay barn were gifts from area businesses. The Horse & Buddy barn, with 10 horse stalls, a tack room, therapy area and office space, sits on 35 acres of pasture land provided by another generous donor. The first facility owned by the organization, it’s a “dream come true,” said Haithcox. Now she’s aiming to up the current horse count from eight to 10, and double the number of riders served each week. But that takes volunteers, supplies and funds. “We’ve been successful beyond our wildest dreams, but we’re ready for the next leap,” Haithcox said. The nonprofit has one full-time employee, program director Holly Confroy, a couple of part-time staff, and volunteers like Haithcox, who by day is a project manager for IBM. They all work to spread word of the needs. That’s because there are always more “miracles” to celebrate. 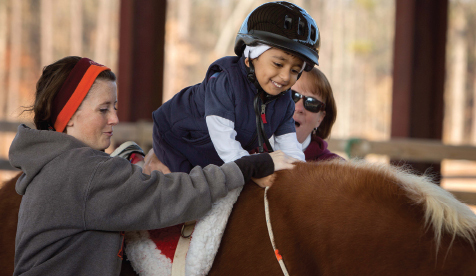 Dhruv Shah of Cary is an example: Four years old and with spastic cerebral palsy, Dhruv had trouble sitting up and spoke only a few words when he began riding in 2011. Thanks to a combo of therapies, he now walks with aid, chats in sentences, and issues commands to “his” horses. He even rides the sensory trail, featuring hills, chimes and a clip-clop bridge for auditory stimulation. For information or to support Horse & Buddy, visit horseandbuddy.org.